Starting school can be stressful for children. The buildings are bigger, there are more children and they are the youngest in the playground. There are fewer adults and more rules, which they don’t know and for many the classroom will be more formal. Did you know a child’s sound language development and their ability to self-regulate are two key factors that underpin learning success in the first years of school and beyond? To help parents/carers and young children navigate what can often be an intimidating experience, Early Childhood Australia (ECA) has created First year at school: Essential tips for parents and carers, written by early learning experts, Jenni Connor and Pam Linke, and endorsed by the Australian Primary Principals Association. Filled with authoritative information and practical tips, this updated resource will help parents and carers support their young children to transition and settle into their first year of school. This well-established publication is very popular with both parents and schools. Your child’s transition to school is one of the most important years of their life. This colourful 66-page publication is easy to read and contains practical tip boxes to help busy parents and carers digest essential information. ‘It was fabulous. The chapters were clear, concise and contain practical information. A perfect resource for new parents’—Felicity Molineux, primary school teacher and mother of three children, NSW. ‘It is simple to understand and extremely realistic. Very good suggestions, also I have read many books and this has covered all topics that are important to parents and children starting school’—Lindsey Panizza, mother of two children, WA. 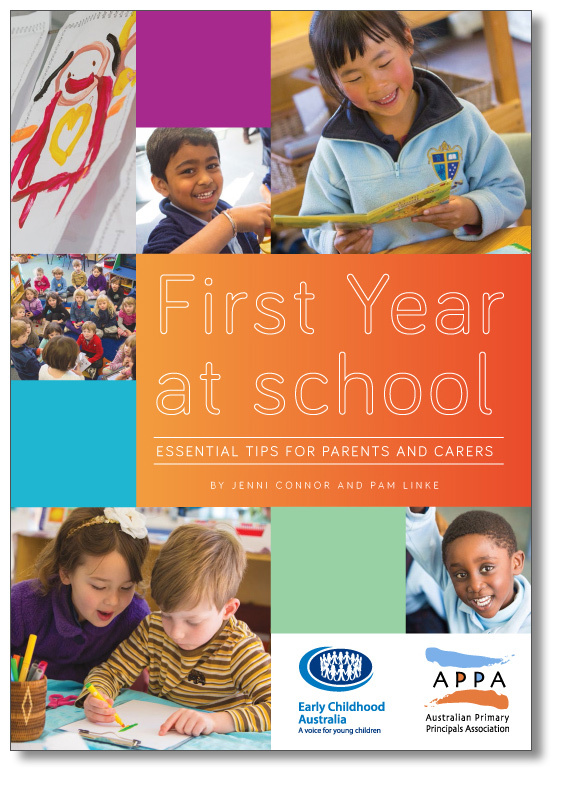 First year at school: Essential tips for parents and carers is great value for only $19.95. Bonus online reference material with each publication! With each copy of First Year at school you will receive 12 months access to additional online materials including fact sheets, up-to-date contact details for government and school related organisations, and useful links to a range of further information for parents and carers. To login online simply use your unique code found on the inside front cover of your publication! Many early learning and primary school services purchase this popular publication in bulk quantities, to provide as practical gifts for families with children entering their foundation year (first year) at primary school. For bulk order discounts (15 copies or more) please call the friendly ECA customer service team during business hours on 1800 360 900 (free call within Australia), email customerservice@earlychildhood.org.au. If you make a bulk order purchase (15 copies or more), ECA will provide practical parent/carer foundation year advice for (optional) use in your school’s parent newsletters or correspondence, to help with your first-year student’s transition to school. To order your copy of First year at school phone 1800 356 900 (free call in Australia) or email customerservice@earlychildhood.org.au.